Stuck in the middle of an arena with hordes of flesh-eating zombies clamouring towards you. You have infinite bullets, Yay! But not infinite health. Sooner or later you are going to meet a gruesome end but why not take as many of those diseased drones with you in #killallzombies. 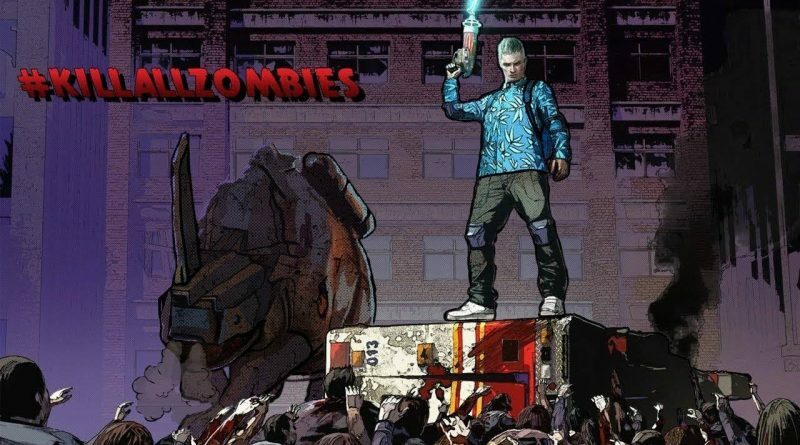 #killallzombies is a third person shooter game developed by Beatshapers. It originally released on Steam back on August 10, 2016. The Steam version allowed spectators to interact and vote via Twitch on events that take place in-game in real time. 18 months later and now, it is time to bring on the pain once again, this time on Nintendo Switch. #killallzombies has civilians running for their lives armed with whatever weapons they can find and must mow down zombies in the name of entertainment. Trapped in an interactive arena that can change form in a moment’s notice. Vehicles, turrets, and other obstacles can spawn at any moment. Armed with only a pistol to start with, you must survive for as long as you can until you can level up to unlock perks or a better weapon. In order to level up, you must earn experience by; you guessed it, killing zombies. There are also Exp enhancers dotted around the arena or hidden in vehicles from time to time. Collecting them will earn Exp to help level up. Perks are abilities that are timed or permanent and can help give you a temporary advantage under the pretty bleak circumstances. Some can increase your experiences quicker, some can help recharge faster. Others will give you a particular weapon for a limited time and there are a few that can bring you back from the dead. There are over 100 Perks and you can choose between one of four every time you level up. You can accumulate perks and then use them all at a later point in the game when things get too challenging. To access perks after levelling up, you simply press the X button and it will give you a random assortment of perks to choose from. Choice between weapons can be few and far between. As mentioned earlier, you start with a pistol. As you play for longer, you can unlock other weapons to use when you collect them. Unlocking weapons also allows you to choose them from the start of each new game. The selection of weapons include; the pistol, shotgun, Uzi, Crossbow, Flare Gun, Rocket Launcher, M16, Plasma Rifle and more. Some weapons can be available to use for a limited time by activating the corresponding perk. There are three game modes to play; Single Player, Vault Defence, Co-Op Play. Single Player and Co-op Play follows the same simple rule of “Stay alive or as long as you can by any means necessary”. In single player, you have to do it all on your own. In Co-op Play, you get to bring a friend along for the ride whilst sharing a single screen. Vault Defence differs in the way that instead of the zombies coming for you, they have a new target, the vault. You will have to purchase and deploy turrets to keep the ever-encroaching enemies at bay. You will also get some mode exclusive perks that upgrade your turret’s weapons temporarily and also permanently throughout your session. The main goal is to stay alive as long as possible. At certain points in the game, new types of zombies are introduced like Zombie dogs or Dongorinos, which are behemoth bosses that can kill you in one fell swoop and can take a while to fill with hot lead. When the inevitable happens, either by some sheer exhaustion or by some silly mistake, you will be able to share your high score online. You can then choose to restart or go back to the main menu. I found after a few attempts to try again, I would just give up entirely and would press the home button and play something else. As a twin-stick shooter, both joysticks are required to play. The left joystick moves your character around. The right joystick will fire your weapon in the direction you push the joystick. The R button reloads the weapons and the B button is to use Melee attacks. As nice of an addition that it is to have a Melee attack, you will almost never use it as the zombies can drop your health bar to nothing in a matter of seconds. Your best bet is to keep moving whilst shooting everything you possibly can and hope for the best. #killallzombies runs pretty well on Switch, which is just as well. The game can be extremely demanding at times when throwing hundreds upon hundreds of zombies at you. Then again, each instance is very small that they most likely don’t consume as much memory to render like they would in a game like Call of Duty. Though most of the enemies themselves are quite small on screen, you can see that attention was paid to the detail. From burning cars to the shape of the falling Tetris blocks (yes, you read that right Tetris blocks), down to the logos on the top and side of the ambulances that can either spawn health or experience depending on the logo on displayed on it. The music has a very indie rock vibe to it but only seems to have one track for the whole game. It can get extremely repetitive after long periods. There are moments when the music completely cuts out after a boss appears and takes a while for it to return. Still, the sound effects are pretty good and the different groans from the zombies does help them to sound less generic. I will admit I found the gameplay very addictive. Unfortunately, you are given the shortest of short straws and absolutely everything is against you. There is no safety net or safe haven where you can catch your breath. The gameplay is unforgiving and only gives breadcrumbs as rewards. The difficulty arc ramps straight up from wave 2-3 onward and it is really a case of luck should you make it longer than 10 minutes. Should you make it longer than 10 minutes, you will experience more enemy types and get access to stronger weapons. However, with no option to save your progress, you can’t decide to take a break and play something else and come back to carry on where you started. While you may get lucky and get a phoenix perk that can bring you back from the dead as a one-time thing. More often than not, if an obstacle like a pit or boss killed you, you will spawn back in the exact same spot you died in and can die again instantly which, is extremely annoying. #killallzombies is certainly a misnomer, as you will never ever kill all of the zombies. I found that, #killallzombies is not a game you want to fully, immerse yourself with for hours. It is okay to kill time with or to try to beat your best score but for $19.99, the price is steep for the gameplay and could do with being made a little easier so that players have more motivation to keep playing.